Genuine Fractals represents onOne Software's continuing commitment to provide photographers with the industry standard for resizing images with no loss in image quality and sharpness. Genuine Fractals 6 adds several new features designed to help photographers get the best enlargements possible. These new features include texture presets, a new gallery wrap function, batch processing, tiling for smaller printers and support for Adobe Photoshop CS5 (32 & 64-bit) and Adobe Photoshop Lightroom. 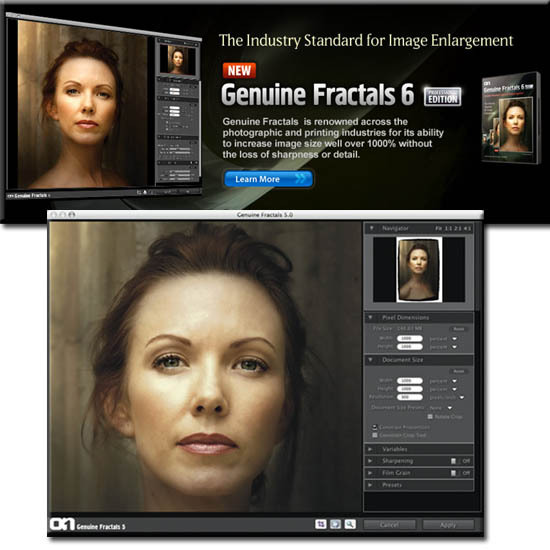 Genuine Fractals 6.05 is the industry standard for resizing images. Genuine Fractals 6.05 Pro is renowned across the photographic and printing industries for its ability to increase image size over 1,000% without the loss of sharpness or detail that you would normally expect. Its patented, fractal based interpolation algorithms work like nothing else and the results speak for themselves. An easy-to-use plug-in forAdobe Photoshop, Lightroom, Genuine Fractals is loaded with resizing features that give you professional results every time. In addition to being able to enlarge images in high-quality, you can also crop and resize images in a single step, resize an entire folder of images with complete control of sizes, resolution, and file formats, and use the new Tiling and Gallery Wrap features to produce stunning prints. Genuine Fractals patented scaling algorithm is fundamentally different from bicubic or other interpolation and resizing methods found within Photoshop or in any other third-party plug-in or standalone application. While other resizing methods sample nearby pixels one-by-one, Genuine Fractals looks for repeating patterns in an image, samples blocks of pixels of various sizes, and patches them together to create a larger version of the original. Sampling and recreating blocks of pixels multiple times in this manner preserves fine details like edges, smooth areas, and textures, resulting in an exceptional quality enlargement. When making enlargements for canvas, it is common to wrap a portion of the image around the wooden stretcher bars, creating a gallery wrap. However, when wrapping an image in this way, important detail can be lost near the edges. The new Gallery Wrap feature inGenuine Fractals 6 automatically creates extended margins by reflecting or stretching the areas near the edge of the image allowing you to create a gallery wrap without sacrificing any of the original image.
? Now you can get large format printing from a small format printer, quickly and easily. The new Tiling feature divides an enlargement into smaller pieces, preparing it for printing on a standard-sized printer. Just specify the paper size and overlap option andGenuine Fractals 6 will automatically resize the image and create individual tiles that are ready for printing.
? New in Genuine Fractals 6.0 is an improved version of the onOne Batch Processing engine. This allows you to resize an entire folder of images to a consistent size and create up to two new versions of an image. You can control the size, resolution, file formats, name and location, color space, and even add a watermark logo.
? Genuine Fractals 6.0 plugin can now be used inside of Lightroom, in addition to Adobe Photoshop.
? Genuine Fractals 6.0 now features texture presets for common image scenarios so even a novice user can get improved texture control results easily. Have you ever tried making an 8x10 print from your digital camera file? You can't get it to fit that 8x10 size - it's either 8x12 or 7x10 - because most digital camera sensors are a different aspect ratio from common paper sizes. This forces you to crop your image to get it to fit a specific paper size, and it can be difficult to determine how to do this and whether to do it before or after youresize the image. Genuine Fractals comes to the rescue with over sixty built-in document size presets that allow you to precisely crop and resize your image in one simple step. Mouse-over the mega-pixel numbers at the top of this chart to view relative image sizes achieved with Genuine Fractals. Support for Adobe Photoshop CS5: Genuine Fractals 6.0.5 adds support for Adobe Photoshop CS5. This includes support for both 32 bit and 64 bit processes on both Mac and Windows. Using Genuine Fractals 6.0.5 with Photoshop CS5 64-bit can be up to twice as fast as the previous versions under 32 bit versions of Photoshop CS4. Defect Correction: Several defects from previous versions have been corrected.